Guaranteed Job Or Double Your Money Back! Now that we’ve got your attention, here is an online home study course you can take in the comfort of you own home. Learn How To Lay Brick Block And Stone! After graduation, I had all the school I could take! I really wanted to learn how to lay brick, block, and stone. I’d been a mason’s helper since my sophomore year in high school where I had worked after school and during the summer. The local masonry contractor I had been working for promised he would teach me to be a mason. As is usually the case for helpers, he never followed up on his promise. I wanted to learn how to lay brick, block, and stone! 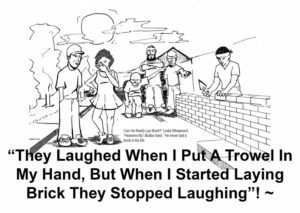 The sad fact is that most mason’s helpers are not taught how to lay brick, block, or stone! 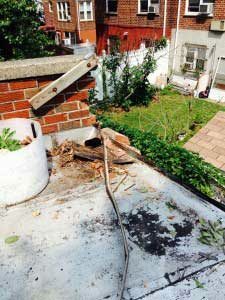 A Few Reasons Why You Will Never Learn How To Lay Brick On The Job! After four years of being a mason’s helper, it was clear that my boss was never going to teach me to be a mason. Why? Because mason’s helpers are also in high demand, and masons who are over 40 years old often do not want to teach a younger person who might later take their job. Special Notice To Mason’s Helpers! Quite a few of our students are folks who have worked for years as mason’s helpers, who were promised training, and yet have still not been trained. Rest assured that while their boss may not teach them how to lay brick, Charlie Cummins WILL! I also checked out the bricklayers union apprentice program and was told that there was a 2 to 3 year wait to be accepted in their apprentice program, with the sons of union bricklayers getting first shot at becoming a union apprentice. The US Bureau of Labor Statistics sees jobs for bricklayers increasing by 12 percent up to the year 2018. The demand will come from a growing population who will need homes, shops, businesses and recreation centers, which in turn will need bricklayers to aid in construction. I Was Ready To Give Up! What does one need to do to become a mason? I was running into one roadblock after another. It seemed like it was easier to get a job in the secret service than to learn to be a mason! One day I got online and Googled, “how to be a bricklayer” and near the top of the results came the link for “Charlie Cummins – www.bricklayingschool.com” brick laying course you are now viewing. 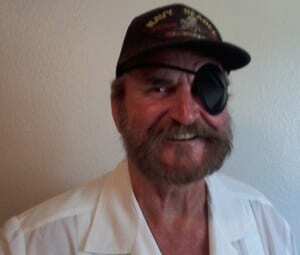 I visited the site and was greeted by an image of this one-eyed smiling guy named Charlie Cummins. The site said, “GUARANTEED JOB OR DOUBLE YOUR MONEY BACK!” It is a hands-on home study course that one can take in the comfort your own home. I watched the sample videos and from my experience as a mason’s helper, I could tell that this guy was the best bricklayer I’d seen in a long time. I was sold when I watched a video of a 47 year old student named Gus who had never held a trowel in his life before starting the course build a brick wall with less than 20 total hours of hands-on training. Frankly, his work looked better than the bricklayers on my crew! Do check a few student videos and photos submitted to us when you get a chance! Gus lives in New York and had never held a trowel in his hand before he got the Master Mason Course. His main purpose in purchasing the course was to repair damage to his home caused by hurricane Sandy (you can see some of the damage on the left). He put $35,000 of insurance money in his pocket in less than a week by doing the brickwork himself. I didn’t tell anyone on the crew I was taking Charlie’s learn how to lay brick course. After finishing the course, one day I jumped on the wall between 2 bricklayers I had been working with for about 4 years. Believe it or not I was laying better quality brick than they were. They asked me where I had picked up my skills from. I told them from a guy named Charlie. I was now the new kid mason on the job! Long story short, I now have my own masonry business and I am well paid to say the least. My good buddy Matt finally got his BA degree in something (I can’t exactly remember what in) but now he needs a job so I hired him as one of my mason’s helpers. When I told Charlie about that he chewed me out! I told Charlie that I did not want Matt to learn how to lay brick because he’s been to college, he’s smarter than I am, and when he sees how easy this is he’ll want to become a contractor and be my competition. Charlie then told me something that I will never forget. He said, “You get what you want by helping others get what they want, that is what we are supposed to do”. He also told me to always try to hire people that are smarter than you. I told Charlie that would be easy for me to do. Charlie said he never had that problem either. 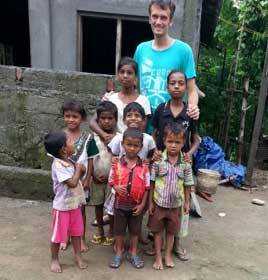 Meet Lars (standing with his ‘kids’) who has been busy building a missionary center for his work with children in India. He’s been using all the methods along with those taught in his bonus book, “The Secret Of Squaring Up Buildings”. I looked through your squaring up book that you sent me now… I understood it! I’ve learnt so much this day, and I’m like a sponge ready to take in more. I want to learn to do this the right way and be a master mason. I’m a guy that likes to travel see different structures of the world, I will do this just like you’re telling me. And the good thing is all the great support I’m getting so my future’s looking bright. I already have a job for next spring if I get this down right. So thanks and thanks for the wonderful videos. Petri, who lives in Sweden, has been studying the brick certification course to make extra money, and has been busy with new projects ever since. 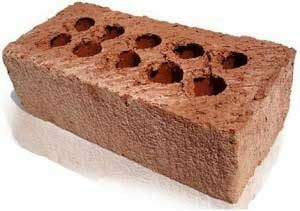 Although this course is aimed at those looking for a job as a bricklayer, it is also perfectly suited to the DIY’er wanting to learn how to lay brick. Perhaps you are building an off grid home and lack the confidence to build the foundation? You CAN DO THIS! The low price of the course is an outstanding value. Can you imagine how much it would cost to actually hire a mason for your home improvement project? You will easily recover your investment when you build that brick BBQ by yourself, not to mention the satisfaction and bragging rights that comes with it. Oh Wait! There’s One “Big Secret” Of This Hands-On Home Study Course Charlie Needs To Mention ASAP! What about all that mortar you will be using? Won’t it get hard? Won’t you have to keep throwing it away ever day? The mortar you will use taking the course contains our SECRET FORMULA! Actually our special mortar has no portland cement in it at all – it will not get hard and you can use it over and over again until you finish the course. All you will have to do is add water to it at the start of each training session and you are ready to go! LEARN HOW TO LAY BRICK BLOCK AND STONE TODAY! Get LIFETIME, Members Only online access for less than what you’ll earn in one day of what this training will teach you! Currently Priced @ Only US $249.00! DUE TO POPULAR DEMAND BY OUR MANY DIY INQUIRIES WE NOW HAVE A COURSE THAT IS PERFECT FOR THE PERSON WHO WANTS TO LEARN TO LAY BRICK, BLOCK, AND STONE AROUND THEIR HOUSE. PROJECTS LIKE A BRICK PLANTER BOX, OR BARBEQUE PIT, OR OUTDOOR KITCHEN, OR FIRE PIT, OR BRICK MAIL BOX. just to name a few projects you can learn to do with this DIY course. HOWEVER WITH THE DIY COURSE WE DO NOT GUARANTEE YOU A JOB OR DOUBLE YOUR MONEY BACK. Currently Priced @ Only US $49.00! We respect your privacy and will not lend, sell, or abuse your email address whatsoever. You may opt-out at any time.